In this explosive book, Adolph Reed covers for the first time the full sweep and totality of W. E. B. Du Bois's political thought. 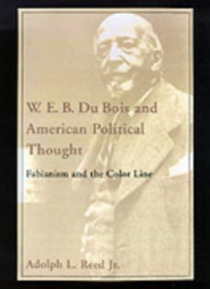 Departing from existing scholarship, Reed locates the sources of Du Bois's thought in the cauldron of reform-minded intellectual life at the turn of the century, demonstrating that a commitment to liberal collectivism, an essentially Fabian socialism, remained pivotal … in Du Bois's thought even as he embraced a range of political programs over time, including radical Marxism. He remaps the history of twentieth-century progressive thought and sharply criticizing recent trends in Afro-American, literary, and cultural studies. Conteúdo alternativo sugerido: Adolph L. Reed Jr.